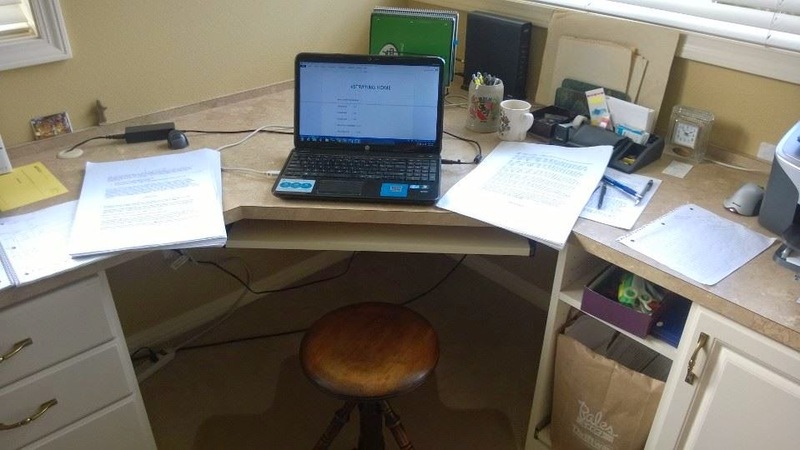 WHAT'S IT REALLY LIKE INSIDE A WRITER'S WORK SPACE? 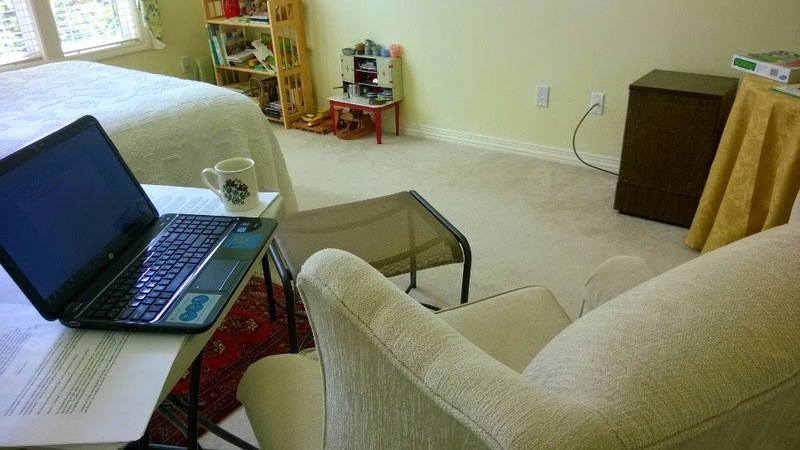 First Question: I see a photo of a work space. Do you have others? Answer: Yes and here's the reason! Space 1, in a room with a built-in desk, faces south and west. At a certain time on a sunny day it's too bright to work there. At that time I move to a temporary desk in a bedroom, Space 2 (below) where I can enjoy better lighting conditions. It faces east. Even better, it has a high fidelity FM system. I'm tremendously thankful to have these two wonderful spaces available in town and another space at the beach. Question: You're not sitting in front of a library of books. I'm surprised. In photographs I've seen writers tend to be backed by books. Why not you? Answer: I have a computer, which gives access to more books than I can imagine. Back in the days of physical printing you'd have seen many shelves of books in my work space. Question: How much time do you spend in your writerly work space(s) every day? Answer: Generally nine hours or more. Question: You spend all that time on writing? Answer: I wish! But I have other demands, including mail and email, brain training games, social site communications and more. Deduct this grab-bag of other stuff and you're left with 3 to 5 hours of writing time a day. It makes me wish for a regular eight-hour writing job. But that's impossible in my current phase of life. Question: You sit in an armchair sometimes, and on a stool other times. Which do you like best? The chair or the stool? Answer: an AARP health article told me I need to sit on a stool instead of in a desk chair to increase use of core muscles. I endure that for health purposes. I think I write best and more easily in the armchair. Question: do you like writing? Answer: This moves away from the writer's room into the writer's spirit. I suppose that the writer's spirit is the true writer's "workroom." In my case, I've always written and always will. Early on, I worked on the high school annual and the college newspaper staffs. I began a shelf of personal journals in 1956. Forty five years ago an editor accepted my first scholarly article for publication. Reviewing all of this, I don't think it's primarily a question of liking, although I do like to write. It's more that I'm driven to write. I'm striving to write better, more flexibly, in various genres. Answer: volume 2 in a series on coming of age. I'm calling it "A Leave from Love." It starts and ends in the Puget Sound area; the entire round trip takes you from there to London, Berlin, Geneva, Dakar, Freetown, Monrovia and back. The first volume in the series is entitled "Growing Green Two Ways!" It's available now. Follow the links. Question: any big issues you're facing? Answer: the writing field is growing more competitive as publishing becomes easier. Adapting one's writing to the continuous changes in media (from paper to electronic formats of many sorts) is probably the biggest challenge for me and others of my age group. After 60 years of writing, there's more to learn than ever. The democratization of publishing channels means that everyone can write. The difficulties relate to learning new publication skills, such as formatting, uploading, and so on. Permit me to ask a question of you: are you writing? Are you "liking" it? I'll bet you are! If not, why not start now?